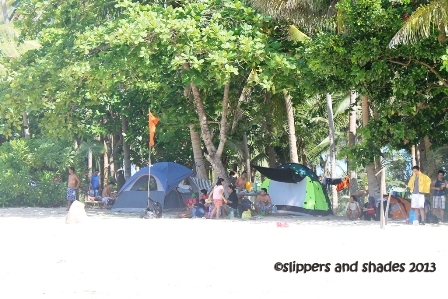 This article is the continuation of our beach escapade in Padre Burgos, Pagbilao, Quezon. Coming from a refreshing swim in Puting Buhangin and a peek from Kwebang Lampas, our boatman, Mang Urong brought us next to Dampalitan Beach for around thirty-minute ride. We carried all our stuff because he will fetch another group from Borawan. But as soon as we were approaching the island, the sky became cloudy. Just like Puting Buhangin the sand of Dampalitan Beach was creamy white though not that fine, the water was also clean and clear. The long stretch had verdant pine trees lined up in the beach front. Tents were pitched everywhere. It was a summer crowd again. 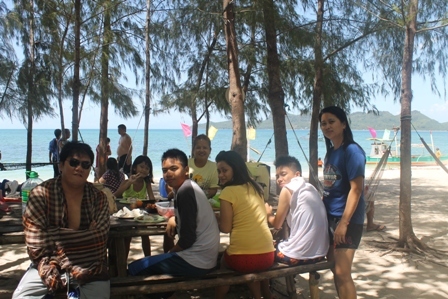 Luckily we got a long picnic table under the shade of pine trees facing the aqua blue water. Near us were nipa huts of various sizes, all of which were occupied by people busy cooking food for their lunch. Oh no, there were also lots of clothes and towels hanged in front of those huts. The caretaker approached us and collected table and entrance fees. Again Shen was free. It was nearing noon time and everyone was starving. The next big thing we did was feasting our packed lunch with these viands: adobong pork, fried eggplant with bagoong, hot dog, tocino and meat loaf. We had banana and watermelon for our desert. Heavy meal indeed. Pao, Miko and Pol were assigned to clean the table after we eat. By then, the stifling atmosphere lessen our energies so instead of wading on the water, one by one took refuge in a hammock for a short nap. My mother on the lead.hehehe. After regaining energy, we munched halo-halo (P20) which we bought from a nearby little hut. And later they all immersed on the water. I was left on guard of our belongings. I didn’t swim when they told me there was a jellyfish. It was then that I noticed the netted area which served as the protection against that sea creature. Mama went back after a refreshing dip and so it’s my time to explore at the back area of the island. Thanks to the shade of pine trees for I don’t need umbrella in strolling around. The island offers a peaceful retreat. If we could have the place all by ourselves I’m sure that would be a wonderful escape from the busy city life. But facing a beach with fiesta crowd, the best thing to do is join them and have fun! By one p.m. we headed to our final stop. Borawan Beach as what Mang Urong told us is the Boracay and Palawan of Quezon. The glow in his eyes, the smile in his face and the way he prided Quezon’s beautiful islands amused me so much. 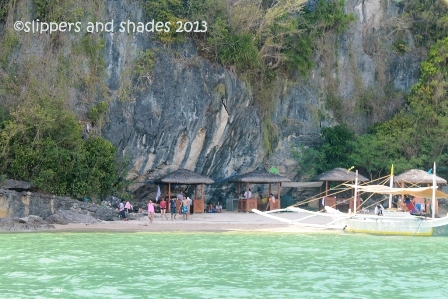 What captivated us from afar where the towering rock formations which is almost comparable to Coron in Palawan. We hopped out from the boat carrying our SLR bag only. The sand was light beige not as fine as the two islands but water was also clear. The shoreline was small. We will not stay long so we did not rent a cottage anymore; instead we just occupied a little space near the docking area. No collector approaches us for the entrance fee. We can’t wait anymore so we hastily explored the whole stretch. There were lots of big rocks on the island. 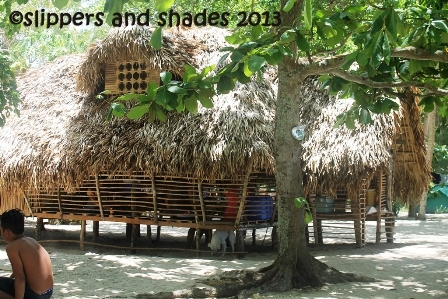 The old and small nipa huts which I saw on the internet were replaced by new and lovely nipa hut cottages. 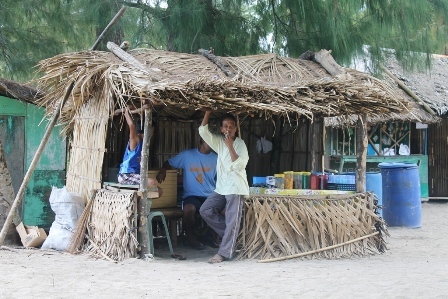 There was a small canteen which sells coffee (P17), halo halo (P30) and souvenir items like t-shirt and shorts. Since there was no key-chain I picked beach stones and kept it in my pocket. That was my souvenir in our Quezon beach getaway. I was static looking up at the towering rock formations. How I wish I was a mountaineer braving a climb to such kind of enormous rocks. There was a nice shower and comfort rooms with minimal fee of P20. We passed by a volleyball area (P40/per hour) and headed at the end of the small stretch. There’s nothing much to see in that area so we went back to our small and quite place. 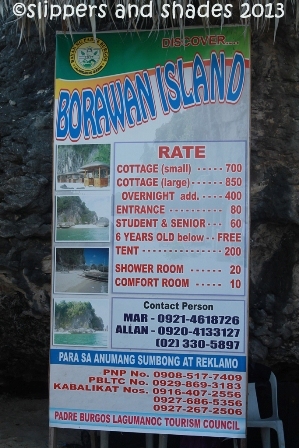 Now I know the reason why Borawan Beach had the highest entrance fee. 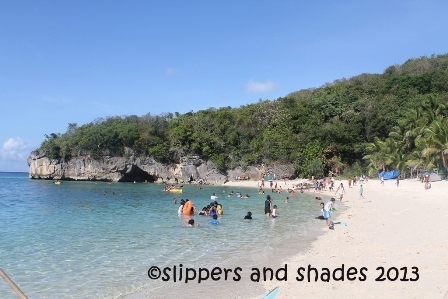 It has better amenities compared to Dampalitan Beach and Puting Buhangin. But I’ve noticed there were only few tents pitched on the area and is not crowded by people. Good points in this island: It was clean, no hanging clothes near the cottages, no big noise, with convenient use of comfort rooms and best of all, its short distance to the main land. We spent the two hours basking under the sun. But moment later, we felt a sudden pinch on our skin and found out it was a sting from a jelly fish. Seeing a big one we headed back to the beach front and spent few more minutes in picture taking. It was then the collector approached us. I thought our stay was for free.hehehe. By 3:30 pm, we went back to Oreto Beach Resort to rinse. We had a slight discomfort in using their comfort room. It has no running water so we used pails to fill the water drum. We put our clean clothes in a mono block chair outside the comfort room because there was no hook on walls.Just the same, we were thankful to the resort for we washed away those sands from our now dark-skinned bodies (P20/head). We paid P100 for the parking fee. By 5:00 pm we headed back to Manila. Travel time took us six hours due to traffic in Sariaya, Lucena and Calamba. Ride a bus bound to Lucena and alight at Grand Terminal (Jac Liner in Buendia or Kamuning).Then take a mini-bus bound to Unisan and alight at Brgy. Maraot in Padre Burgos.Jump off point is either at the back of Coastal Grills (former Vista Playa Restaurant) or Oreto Beach Resort. Coming from Manila, take SLEX and exit through Santo Tomas. You will pass by at these towns: San Pablo City, Tiaong, Candelaria, Sariaya and Lucena City. From Lucena City proper, take the Lucena Diversion Road road going to Pagbilao. There is a fork leading to Bicol on the left and the right to Padre Burgos. The arch “Welcome to Bondoc Peninsula,” is your gateway to Padre Burgos. It may take you 15 to 20 minutes reaching town proper and few more minutes you will be heading to Barangay Maraot where you will find the jump off point. 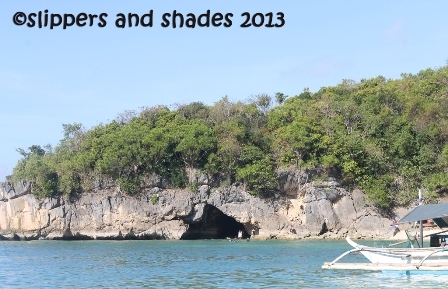 I was amazed when I saw pictures of Puting Buhangin in Pagbilao Grande Island in Quezon. When my family rejected the idea of going back to Baguio for a Holy Week getaway, I showed them pictures of this island. 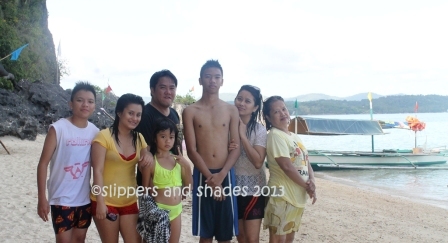 Beaming with excitement, they all voted for a Quezon family beach getaway. Holy Wednesday Night. We searched for contact numbers of hotels, room and boat rental on internet. Tamarind Tree Hotel had only one available room left on Saturday, it was family aircon room with rate of P1,100/per head, no breakfast. Villa Anita did not reply. 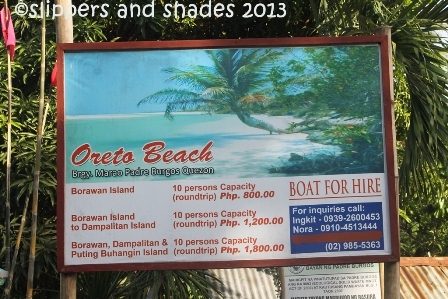 P350/head fan room was offered by Beverly on Barangay Maraot with boat rental of P1,800 for island hopping (PutingBuhangin, Dampalitan and Borawan). Nino offered boat rental with same rate but no room. Both were available on Saturday. My hubby decided not to stay overnight for travel time going back to Manila from Pagbilao will take three hours only. We did not confirm for reservation for surely we could get an available boat on Saturday. Good Friday Night. Me and my mother woke up at 2 am busy cooking food since we were informed that there are no stores on the islands. We left Manila at 3:15 a.m. Heavy rain poured down when we were in Sariaya. But thank God it stopped in Lucena. At 6:04 a.m. we were at the “Bondoc Peninsula” arch heading to Padre Burgos. Along the way we passed by a sari-sari store and bought ice, one 5-gallon mineral water, 2 tetra packs juice and biscuits for Shen. 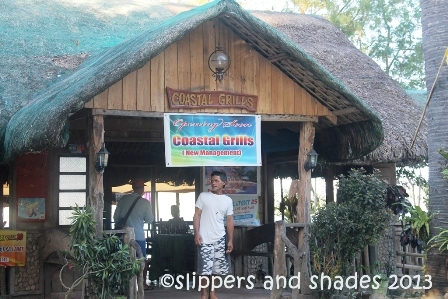 We headed to Vista Playa Restaurant in Barangay Maraot, the jump off point for the island hopping. Little did we know, it was now Coastal Grills under a new management. A local guided us to a parking lot just across the restaurant. 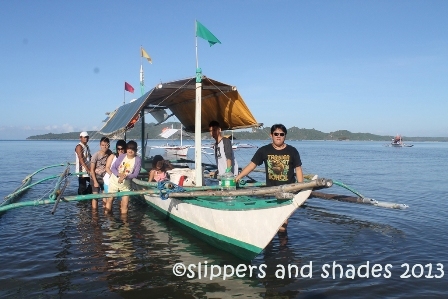 Knowing where we will go, he offered boat rental for P1,800 owned by the name Mang Urong. We did not haggle anymore knowing it’s the standard rate this peak season. We ate our breakfast in our van and were fetched by Mang Urong at 7:15 am. We carried our foods and backpacks and off we went at the back of the Oreto Beach Resort which was a few distance away from Coastal Grills. Our boatman was so accommodating that he helped us carried some of our stuff. The sight of vast expanse of blue water had initially tickled the adrenalin rush. It was a beautiful Saturday morning as the blue horizon was waving hello to the radiant sun. I can’t help not to imagine a wonderful beach adventure a minute from now. But it all stopped when a man who seemed to be a collector approached us and collected environmental fee (P20/head). All I thought this was already included in our boat rental. Nothing to argue, we paid the fee. The collector issued official receipt. Shen was free since she was only six years old. We traversed a shallow water before reaching the boat. It’s not an ideal swimming area but we’ve seen dozens of kids soaking on the water. Mang Urong’s back-up was in another boat so he was the only boatman in our ride. There’s nothing to worry because his boat had safety provision. The warm gentle breeze was so invigorating. My eyes were drooping as the boat danced with the gentle waves. 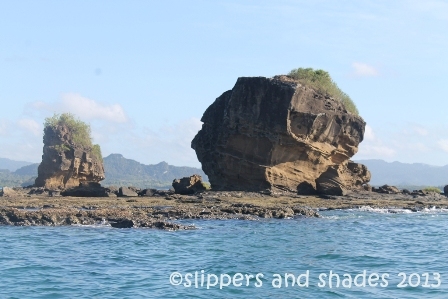 But when we passed by an islet with unique rock formations, all my senses came alive. 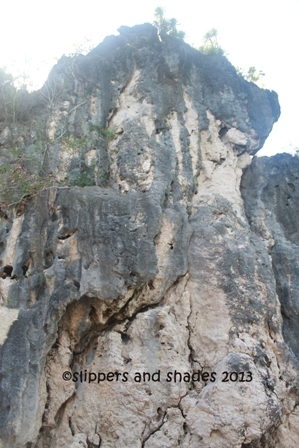 The enormous rocks according to Mang Urong were called “Ang Mag-asawang Bato”. I wanted to go there for photo shooting but the boat can’t come close due to harmful sharp rocks. Seeing my eagerness, Mang Urong gave me the instruction in getting there. But no one from my buddies wanted to swim across the water so we just laughed of our little sea cowardice. Puting Buhangin was stunning in a distance. The white small island was gleaming indeed. The water was crystal clear. But sand wasn’t that fine. Lots of tents were pitched on beachfront. It was a fiesta crowd. Not surprising since it was summer time. The caretaker immediately approached us and collected entrance fee. 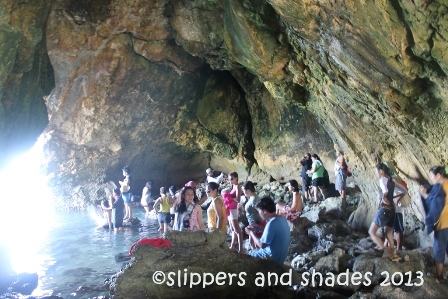 We headed first to the famous cave Kuwebang Lampas before we indulge ourselves to swim. It was located on the left end portion of the beach. There were sharp craggy rocks on the way so it’s a must to be extra careful. The cave had two openings. It was said that there are snakes inside the cave, but I don’t think it will sneak that time as the place was packed by curious visitors. Rock formations and stalactites were those good things to see inside. But I was dismayed seeing vandalized writings on the wall. We went back to our boat to get our swim wears and headed to changing room at the back of the resort. It was quite amusing seeing a camping jamboree with more people in this particular area. The smell of grilled foods was wafting in the air. Some were frying fishes using fire woods. Beside those tents were hanging clothes on wires and lots of supply of mineral water in blue container. But what was so disappointing to see were those garbage scattered everywhere. Inside the changing room was again lots of garbage. And to my dismay there were sanitary napkins inserted on nipa walls! I hope the management will do something to maintain the cleanliness of the island though it was peak season. They should allocate lots of garbage bins and more caretaker to clean the surrounding. The muggy days of summer hit the entire country and the best thing to do is to SWIM! We waded on the water for three hours. Paused for few minutes to eat snack and rushed off to the water again. 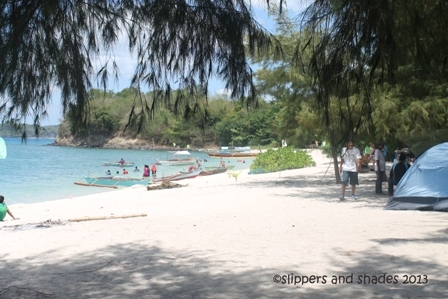 Satisfied, tired and refreshed, we headed to Dampalitan Island by 11 a.m.